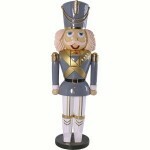 This giant nutcracker is big enough to stand guard for a lot more than just your Christmas tree! 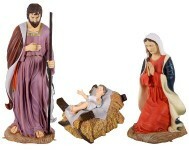 This jumbo decoration is ideal for Christmas enthusiasts and decorating extremists! He stands 8 feet (94 inch tall). He is standing on a red and gold drum. It is perfect for any large Christmas display, especially in commercial areas such as shopping malls, supermarkets, and banks. It is crafted with fiberglass and polyresin. UV stabilized.